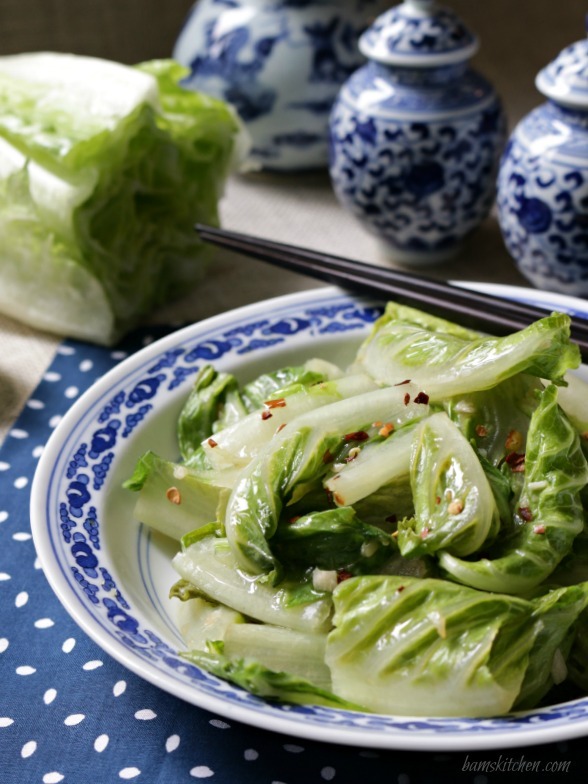 Stir fried crispy romaine lettuce has a light essence of ginger, garlic, sesame oil and chili flakes, if you like a little kick, and is the perfect way to eat your salad in the cooler months. What??? Cooked romaine lettuce??? Are you insane??? Lettuce is supposed to be served cold!!! When most people think of eating lettuce, they think of a nice cold tossed salad to accompany a meal. 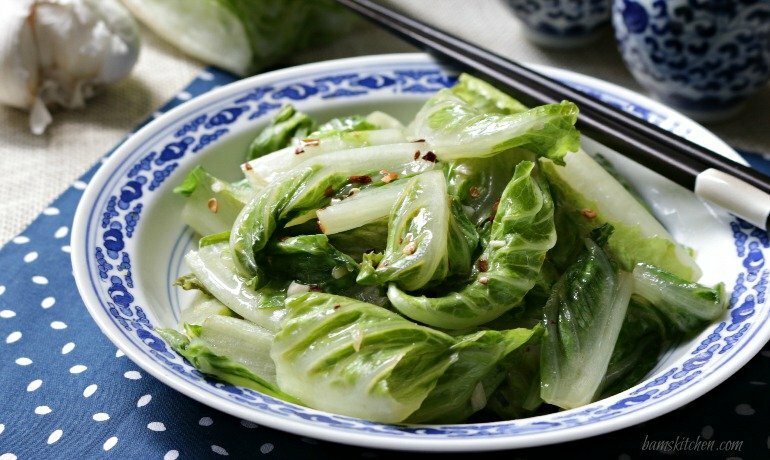 However, do not knock this stir fried romaine lettuce recipe until you have tried it. 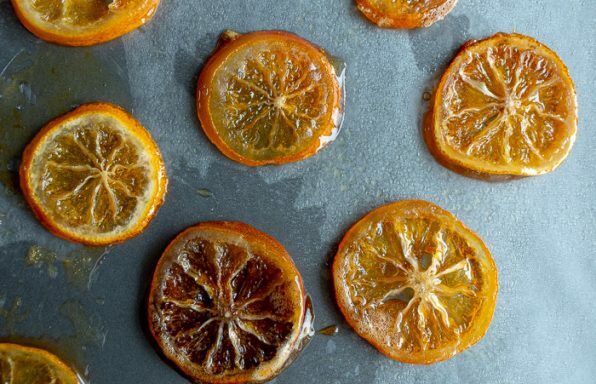 It is crispy, light, flavorful and ready in less than 5 minutes from start to finish. Sometimes in the restaurants in Hong Kong, this lettuce dish will be smothered with a thick sauce. I prefer a lighter version of this dish. 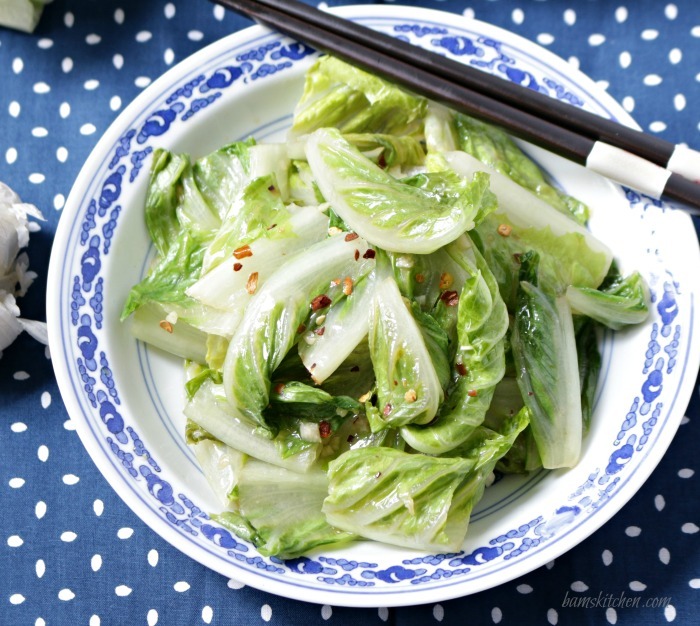 My family likes a combination of roughly chopped romaine, garlic, ginger, shoaxing wine, dash of salt and white pepper, drizzle of sesame oil and a sprinkle of dried chili flakes. Stir fried romaine lettuce is light, healthy, gluten-free, vegan, diabetic friendly and cardiac friendly. 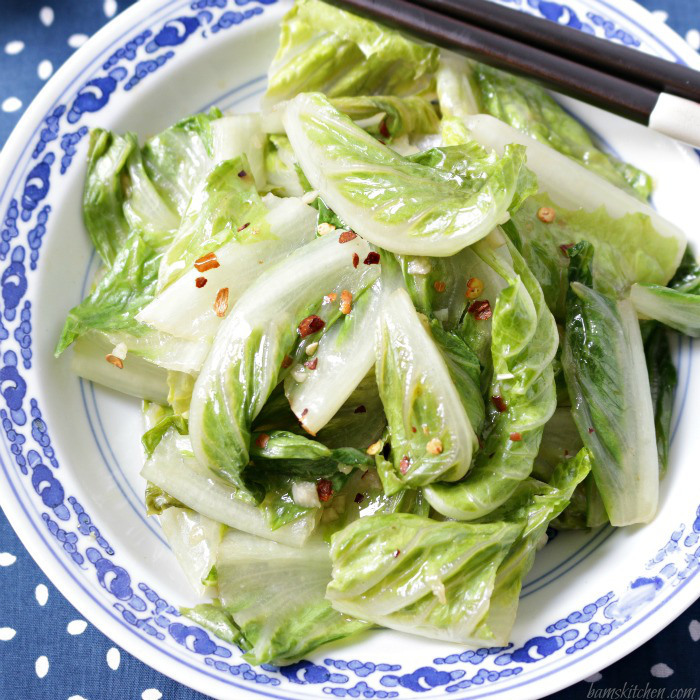 Stir fried romaine lettuce, is a great alternative to a tossed salad in the cooler months. It is a completely balanced food with the yin properties of the lettuce and the yang properties of the garlic and dried hot chili flakes. However if you do not believe in any of these theories, no worries just try the dish anyways just because it tastes great. In less than 5 minutes you can have a crisp, spicy vegetable dish will knock your socks off. Generally speaking, Chinese culture does not usually include eating too many raw foods. Everything is either stir fried, steamed, fried, placed in a soup or placed in a hot-pot, including their lettuce. In addition, Chinese Traditional Medicine (TCM) and Chinese nutrition therapy there is a relationship to food in the prevention of diseases and it has been around for 1000's of years, so it can't be wrong. One of the central ideas in this belief system is that certain foods have a "hot" or heat inducing quality (yang) while others have a "cold" or chilling effect (Yin) on one's body, organs or "energy" levels. The idea being that upset to one's natural balance of "heat" and "cold" in a body can cause disease or be more conducive towards sickness. Yang foods are believed to increase the body's heat, while Yin foods are believed to decrease the body's heat or decrease the metabolism. Just to confuse you a little further some fruits and vegetables can be yin, some yang and some neutral (such as sweet potato and carrots). According to TCM, lettuce is a cooling (yin) vegetable. Ginger and chili are heating (yang) vegetables/herbs. 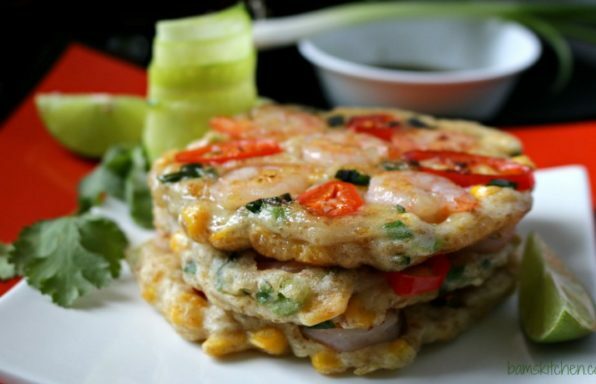 Therefore the mix of both the yin and yang attributes give this dish a nice balance. I know that no matter where you are around the world you can relate to this. Some of you are still shovelling the snow off your roofs (that is a new kind of hell), some of you are ending summer such as in Australia (too cold to surf ) and some of you are in the super humidity of the tropics (REALLY bad hair days) like me. The key word here is change. We are in changing seasons and when the body experiences the change from hot to cold or cold to hot in the weather more illnesses such as the common cold and flu decide to come around. Please be good to yourself and increase your immunity by eating healthy balanced (ying/yang) foods and getting plenty of rest. 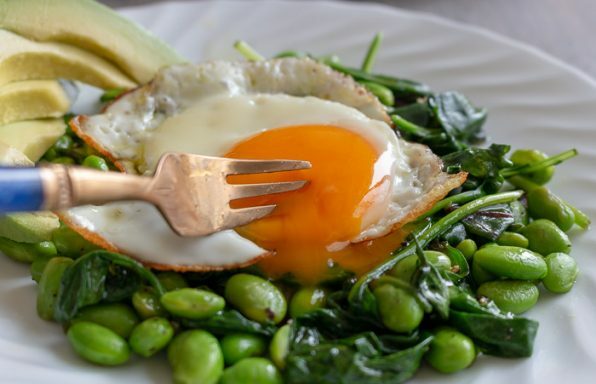 Generally speaking, Yang foods tend to be dense in energy from fat, while Yin foods tend to have high water content. My Chinese friends ideally try to eat both types of food to keep the body in balance. 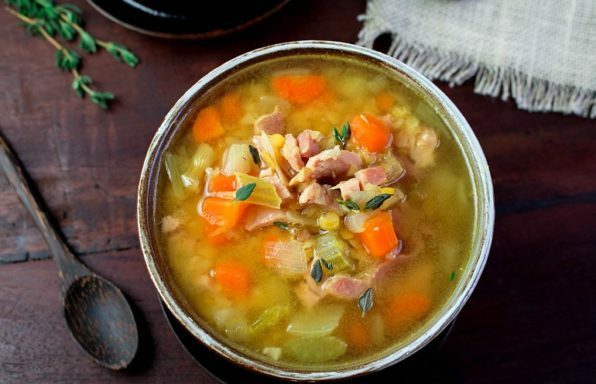 Maybe even without thinking about it, even if you do not have a Chinese heritage, you normally crave lighter dishes such as salads and such in the summer months and in the winter we crave soups, stews and carbohydrates. It is just a natural thing. Romaine lettuce is used instead of other lettuces such as loose leaf, rocket, mesclun and butter head as it is firm and can hold up to the stir fry process. Iceberg lettuce also works too. However, endive and radicchio can also be used but they have stronger flavours and I like the delicate taste of the romaine. Don't you love my beautiful blue plates displaying my stir fried romaine lettuce from Foshan, China?!! 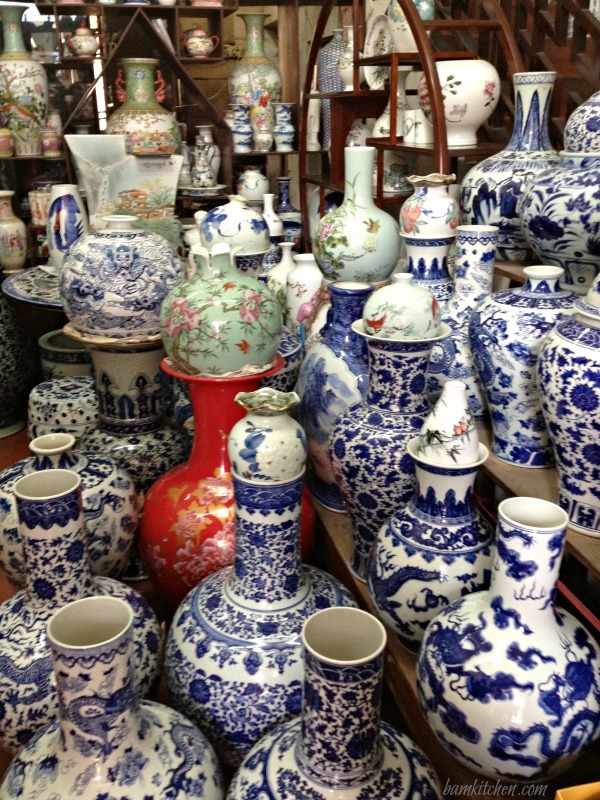 If you ever head my way you have to for sure check out Foshan as this town is just about 2 hours and 55 minutes hours bus ride from the Hong Kong border and they have shops and shops filled with gorgeous Chinese little dishes, vases and plates. If you are foodie or a food blogger, you know how we all have this love/obsession for small little plates and dishes. Check out these lovely vases below... I need a bigger kitchen and more cupboard space. 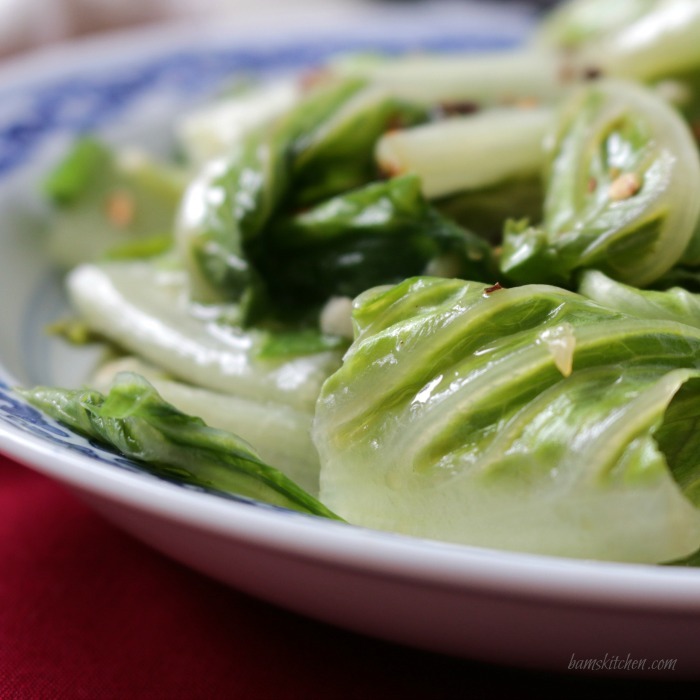 Some of my older followers might remember my "Spicy Stir Fried Romaine Lettuce" as an old post from November 15, 2011. 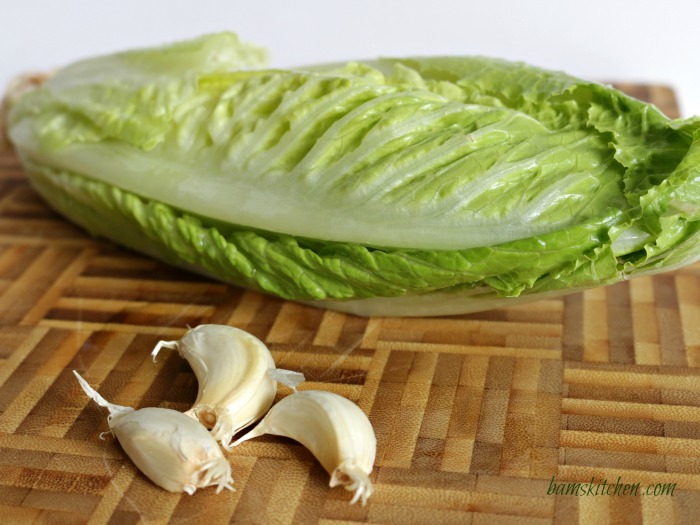 Stir Fried Romaine Lettuce is a great little recipe but my photos needed a little CPR and more updates are given to the recipe details to make it easier for you to make in your own kitchen. 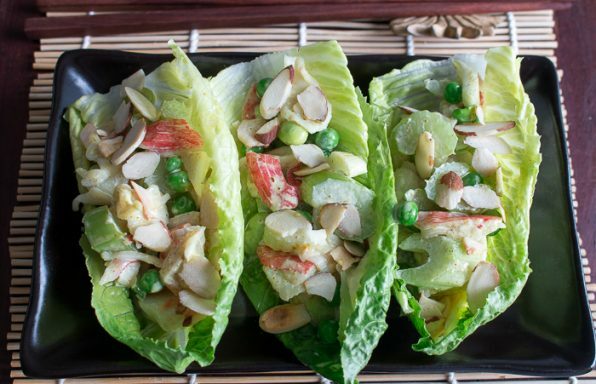 The next time you open your crisper and you see romaine lettuce, I hope you give this recipe a try instead of making a side salad to go with your meal. Have a super day! 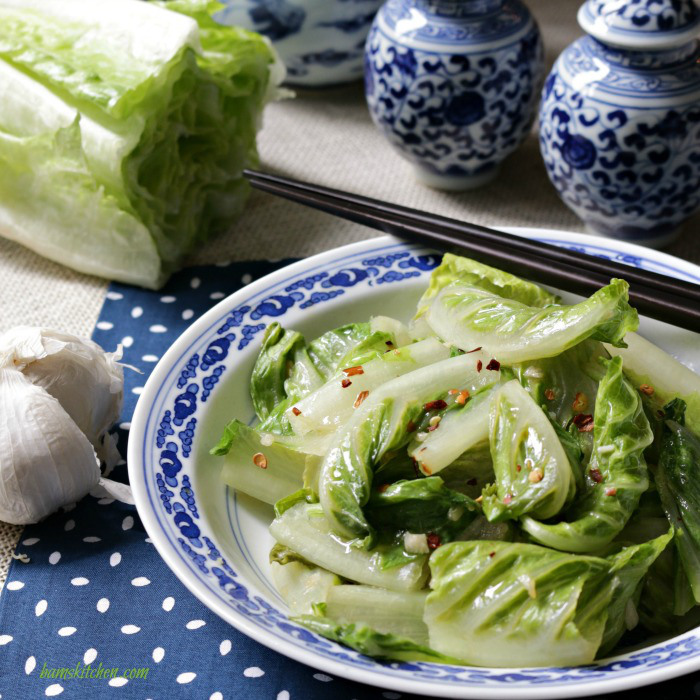 Stir fried crispy Romaine lettuce has a light essence of ginger, garlic, sesame oil and chili flakes if you like a little kick and is the perfect way to eat your salad in the cooler months. 1In a wok or frying pan add your canola oil, ginger and garlic and fry about 1 minute until aromatic. 2Add the cut and dried romaine lettuce, salt and white pepper (I prefer the light flavours of just a light dusting of salt and white pepper but you can also use one tablespoon of soya sauce (tamari) or even 1/2 teaspoon of gluten free vegetable powder, if you wish), sugar (optional), shoaxing wine and toss quickly. Immediately Remove from heat: It is very important that you remove the roam in lettuce from heat while the romaine is just starting to wilt as the heat from the pan will continue to cook the romaine lettuce even after you remove it from the heat. Drizzle over sesame oil and dried chili flakes if desired and toss. 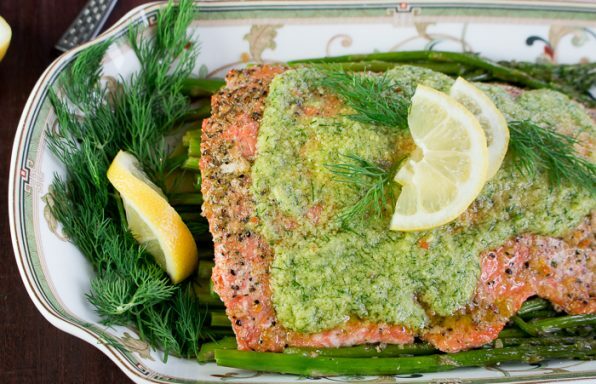 3Enjoy as a delicious healthy vegetable side dish.